Steve Smith announced his marriage with Dani Willis on Instagram where he shared a picture of him with his now wife. The Australian cricketer was in his super dapper look during the ceremony while Dani was looking ever graceful in a white satin gown. Former Australian cricket captain Steve Smith, who is currently spending time in exile, announced his marriage with his long-time girlfriend Dani Willis on Saturday. 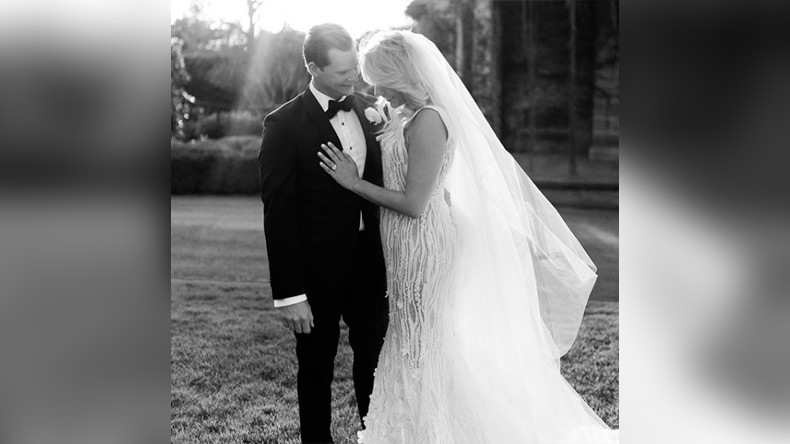 The two tied the knot in a private ceremony held in the Australian Southern Highlands. The marriage ceremony has come seven months after the couple announced they will tie the knot this year. The Australian cricketer was in his super dapper look during the ceremony while Dani was looking ever graceful in a white satin gown. Steve and Dani’s marriage ceremony was a star-studded event where Australian cricketers Aaron Finch, Usman Khawaja, Nathan Lyon, Mitchell Marsh, Pat Cummins and Moises Henriques were present along with many others. Earlier in July 2017, the couple had gotten engaged in a private ceremony at the famous Rockefeller Centre in New York. It was there where Steve Smith proposed his lady love and she said the magical word to him. Steve Smith has endured a tough 2018 after he was found guilty in a ball-tampering incident that shook the cricketing community. He was handed a year-long ban along with David Warner. However, the duo has been plying their trade in the Global T20 event that was held in Canada. They also played in Carribean Premier League recently.